You can find very few machines in a CrossFit box, rowing machines are often a staple, but more and more gyms are outfitting their facilities with Air Bikes. These suckers were initially developed for seniors with limited mobility. But don’t let that fool you, they are nothing if not a brutal form of conditioning. So much so that they’ve earned the nickname “Satan’s Tricycle” and for good reason. It’s not complicated; it doesn’t matter who you are, you have to do some form of cardio. That ticker isn’t going to maintain itself, and cardio speeds up your recovery. As winter creeps in, you’re going to be inside more than you want to be, and Air bikes are a fantastic ‘default ’ exercise even for the most neglectful of cardio pursuers. The Fan Bike is a fantastic way to smuggle cardio into your routine. Even famous powerlifting coach and king of the meatheads Jim Wendler is known to profess his love of the air bike. If, arguably, rowing is the King of total body conditioning; fan bikes are the prince. 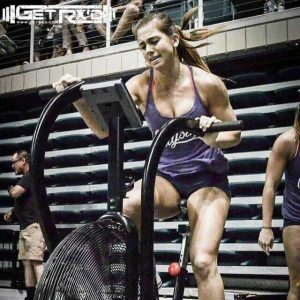 An air bike provides you a great way to modify your total body conditioning if you have an injury that prevents you from rowing, or, if you are sick of, or don’t like rowing. It has long been an excellent piece for rehab, as it provides a safe movement with no impact while allowing you to continue to do cardio, and provide blood flow throughout the body to increase the healing of your damaged areas. Where the Air Bike truly shines as the de facto metabolic conditioning tool. Tabata, intervals, and the air bike are a match made in heaven. Changing up your routine can help push through those plateaus. Even popping on Netflix and casually cranking out a few miles is an excellent way to sneak in your cardio. Just as important, using an Air Bike can also enhance your mindset. If you have ever used an Air Bike at high intensity, you know it isn’t easy. When you get on it at a high intensity, it will indeed test your mental fortitude as your arms and legs swell with lactic acid, and scream for relief, it feels as though you are biking through fire. Despite the name, your rest days truly should not involve purely relaxing, if you are trying to minimize your recovery time. Studies have shown time and time again that some light activity on your rest days, or even the day after a game, can lessen recovery time by providing mobilization and blood flow to flush out unwanted waste products, like lactic acid, lingering in your muscles. The Air Bike does just that, moving your entire body together, and increasing blood flow to all parts. The bottom line is that an Air Bike is a must have tool in your gym. It’s perfect for recovery, long cardio stretches, and intervals. Plus it’ll give your grandmother more reason to come over and visit. Interested in getting a rower for your home or gym? Then check out the Xebex Air Bike below.